A local historian tells the story of Nongae and the Hideyoshi Invasions of Korea during the Nongae Festival on May 23, 2008. Each year the city of Jinju in Gyeongnam Province celebrates several major festivals including the Namgang Yudeung (Lantern) Festival, the Gaecheon Art Festival, and the Traditional Masked Dance Festival. This spring's Nongae Festival was held on May 23 -25, 2008 in Jinju City, Gyeongnam Province. Nongae is a symbol of national patriotism and an exemplary selfless woman, the Korean counterpart to Joan of Arc. In 1592 Japanese General Hideyoshi first invaded the southern coast of Korea. 200,000 Japanese landed in Jinju and were defeated by only 3,000 Korean defenders from Jinju as well as the surrounding provinces. Because of its location, Jinju is a stronghold and gateway to the surrounding provinces. During the second Hideyoshi Invasions in 1593, in order to secure a victory, 200,000 Japanese soldiers were sent and every living thing in Jinju was to be slaughtered. Nongae's husband and the chief commander of Jinju Fortress, Choi Gyeonghwae, died in battle. 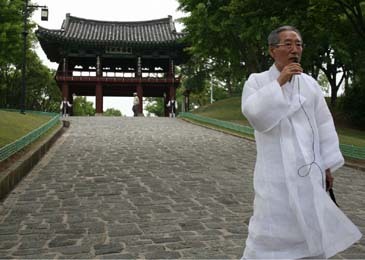 Jinju Mayor Jeong Young-Seok performs the chesa ceremony for Nongae at the Chokseokru Pavilion in Jinju on May 23, 2008 . Nongae was heartbroken and still only twenty years old. Posing as a concubine, she put on her best makeup and jewelry and went out to wiam ('dangerous") rock on the Nam River. While the Japanese were celebrating their victory, Nongae seduced General Geyamura Rokuske out to the rock. Embracing him tightly, she threw herself into the water. The "dangerous" rock has now come to be called Euam meaning "righteous rock." Uigisa was built to honor Nongae, and it is the only shrine in Korea dedicated to a woman. The name Uigisa can be broken up into its parts: ui meaning "rightful," gi from giseng, a female entertainer, and finally sa meaning "shrine." Each year Nongae's portrait is revealed at Uigisa during an enshrinement ceremony. The golden "Rings of Nongae" on the piers of the Jinju Bridge. Next to Uigisa stands the Chokseokru Pavilion built in 1241 during the Koryo Dynasty, though it has been destroyed and rebuilt several times. 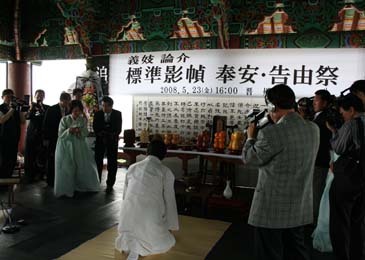 During the festival Jinju Mayor Jeong Young-Seok performed the chesa ceremony; this is traditionally performed on certain holidays and death anniversaries to honor family ancestors and filial piety. The highlight of the festival is a dramatic nighttime reenactment of the historic event at the original site complete with interpretive dancers, period costumes, and traditional Korean music. The audience sits atop a floating dock in the middle of the river and after the show is treated to fireworks from the opposite bank. Bullfighting has been a Jinju tradition since around 1900. 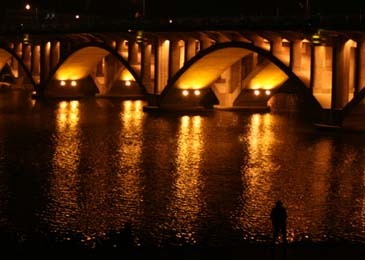 Golden rings can be seen on the Jinju Bridge's piers. These are called the Rings of Nongae, symbolizing the rings she adorned herself with in order to seduce the Japanese General out to Euam Rock. One local specialty restaurant's walls are covered in turtles. Because of their long life spans, turtles are a symbol of longevity and good health. The restaurant serves eel as well as "Jinju," a liquor made and sold exclusively in Jinju. The Jinju Biocluster includes several facilities for chemical, food, material – particularly silk – and other research development. While Jinju currently produces 80% of South Korea's silk, this industry will soon be replaced by biotechnology. The idea behind the Biocluster is to create a world-class facility by clustering many industries in one place. 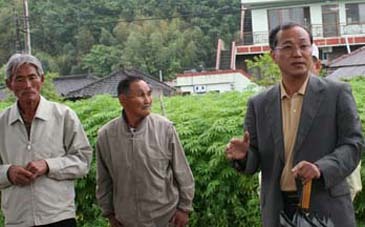 Mr. Kang Joong-Seok, executive director of Korea Tourism Organization's Gyeongsang Office, explains how the marijuana plant is made into threads for sambe clothes with two villigers. Behind him is the field of marijuana. 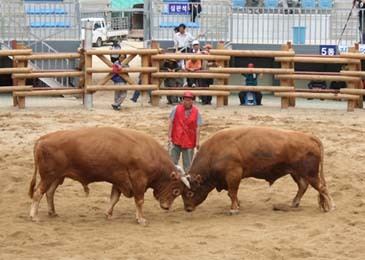 Bullfighting is a somewhat recent Korean tradition dating back to around 1900; bullfighting's popularity saw its peak of popularity during the Japanese occupation. The official cartoon bull emblem now used is modeled after the bull Mangwoo, a legendary bull that overcame a fractured horn and became the champion of Jinju bullfighting during his time. One small farming village is completely unique. With special government permission and a 2.2 billion won investment, marijuana is grown exclusively to make burial clothing through a complex and tedious process. Though very expensive, the material is odorless, breathable, and completely biodegradable. 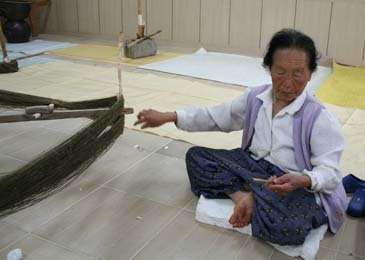 A woman weaves material extracted from the marijuana plant to eventually be made into burial clothing in Jinju, South Korea. The seeds of the marijuana plants are used in certain dishes. One folk story tells of an illness suddenly cured by chicken soup prepared with the seeds. Now the seeds are also used to make beef soup and the traditional Korean wine makoli. Elise Jong-Eun Yoon is serving as a staff reporter of The Seoul Times. She studied telecommunications at Michigan State University in the US. She covers the diplomatic community, travel industry, and other cultural events. Her hobbies include listening to music and swimming.